Atlas Dental Scholars - ADC Training Material List by Dr. Luck Pal Singh. Essential Training Material to be carried by the ADC / OSCE student appearing for Australian Dental Council Exam. Works with Columbia Jaws, Nissin Jaws And Frasaco Jaws. Bench Mount includes = Plastic Skull, Connecting Plates, Magnetic Articulator, Fletcher Cheeks, Connecting Rods, and Bench Mount Clamp. Chair Mount includes = Plastic Skull, Connecting Plates, Magnetic Articulator, Fletcher Cheeks, Connecting Rods, and Strap. ADC NEO Manikin, designed especially for the Australian Dental Council assessment exams, mimics the manikin provided during the exams. The Bench / Table Mount variant includes Magnetic Metal Articulator with TMJ, Metal Skull with ears, Connecting Plates, DM-1 Columbia Fletcher Cheeks Mask, Connecting Rods, and Bench Mount Clamp. It can be purchased with or without the Magnetic Columbia Dentoform SMPVR860 Jaw Set. This Columbia Dentoform Jaw model is also used for the Australian Dental Council ADC / OSCE exams conducted by the Dental Board of Australia (DBA). The Model 860 Dentoform are used to provide students with a great level of detail, including a 30° condyle and an inclined Curve of Spee. The models and replacement teeth can be utilized for teaching restorative, fixed prosthodontics, orthodontic, endodontic, partially edentulous, and anatomy and occlusion courses. 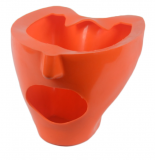 The models can be adapted to fit our manikin systems, and individual teeth are easily replaceable for study or for the replacement to permit the additional practice. The soft gum model with the spring-joint articulator. Replacement Typodont teeth for Columbia Dentoform PVR 860 Removable Ivorine® Numbered Teeth without screws. Screws and Screw Driver price is per piece. Caries Simulated Teeth for Australian Dental Council ADC Australia Exams. Specifically produced by Columbia Dentoform USA for the ADC exams. Dentine / enamel simulated teeth have a layer of Ivorine® with a pale yellow dentine layer beneath. The enamel and dentine layer have different cutting characteristics to more realistically simulate natural teeth. These are available for all permanent teeth. ADC Manikin Fletcher. (for Navadha Manikin only). It may not fit any other manikins.